This e-college program in accounting presents basics of accounting for beginners. 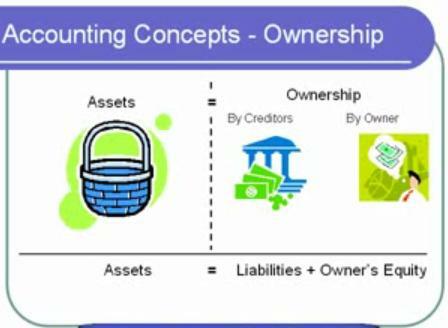 The starting process is to understand what is accounting and what is hiding under Accounting Equation concept. Afterwards, Accounting Cycle and detailed description of its each step is presented and supported by practical examples in order that you understand basics and have an opportunity to practice gained knowledge. analyzing, recording, and summarizing, financial data of a particular business activity. 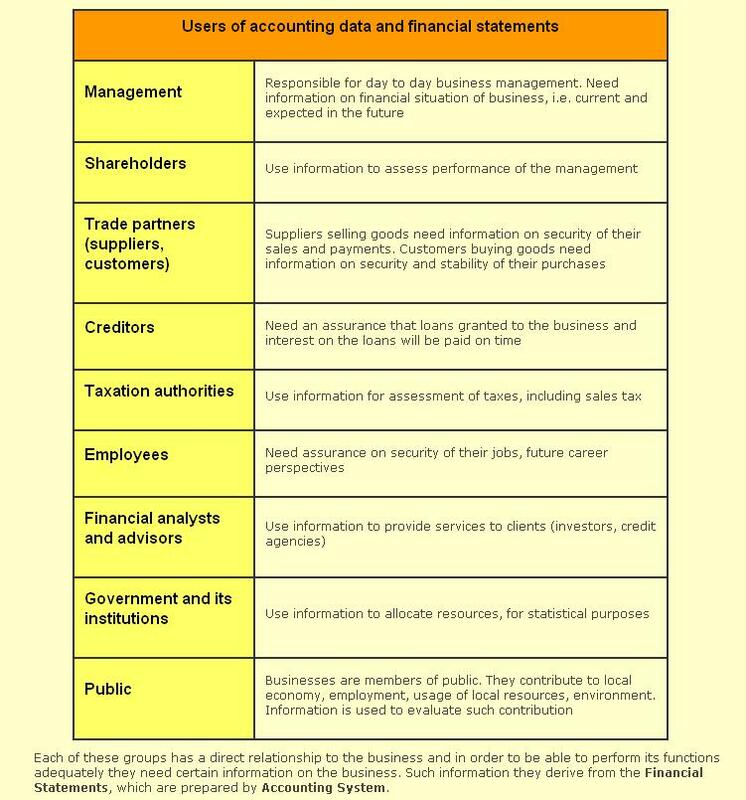 Financial data – actual business transactions (for example, sale of goods, provision of services, purchase of assets). 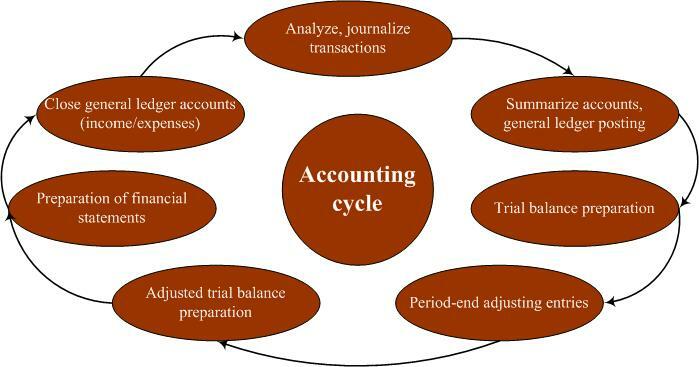 Transactions are supported by certain source documents, which are analyzed and are used as a basis recording transactions Accounting Cycle is a process of analyzing, summarizing and recording transactions, which have an impact on the financial position of a business. Purpose of this process is to prepare financial statements and have an accurate and timely accounting data based on which interested parties (owners, creditors, suppliers, customers, employees, governmental institutions and other) can judge on the results the business has achieved during a particular period of time, on the assets the business possesses and on the financial means used to finance these assets, i.e. liabilities and owners’ equity. 1. Role and purpose of Accounting in Business. 2. Types of business and ownership structures. 3. Users of Accounting information and information provided. 4. Career opportunities in accounting and the Accounting Career. 5. Major areas of accounting and specialization. 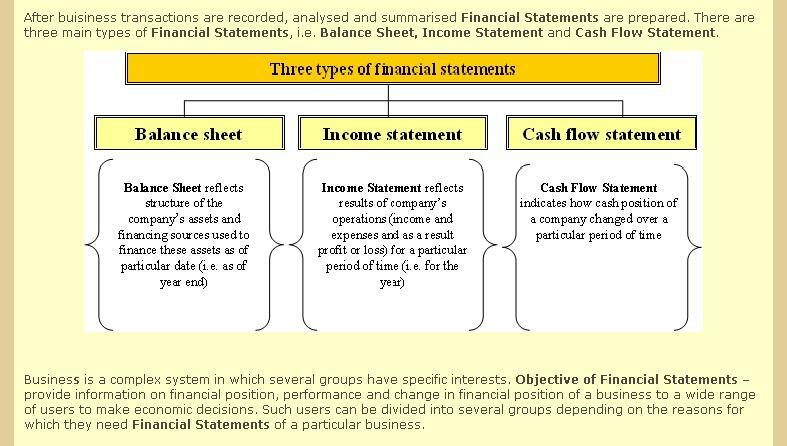 6.	Business elements of the balance sheet and the income statement. 7. Accounting equation and its use in accounting business transactions. 8. Relationship of revenues and expenses to owner’s equity. 9. Effects of business transactions on assets, liabilities, owner’s equity, revenues and expenses. 10. Contents of the basic Financial Statements. 11. Learn the accounting terms introduced in this chapter. The role and purpose of accounting is to provide useful and timely information about the financial activities of a n individual, business, or other organization. In addition, accounting provides information to other stakeholders to use in assessing to economic performance and condition of the business. Without realizing it, you may have participated in an accounting transaction today. 1. Service business – this provides services to customers like professional services, transportation, entertainment, financial, and telecommunications. 2. Merchandising businesses – this purchases products from other businesses and sell them to customers. 3. Manufacturing business – this converts materials, labor and overhead into finished products that are sold to customers. 1. Proprietorship – is a business that is owned by a single individual. 2. Partnership – is a business that is owned by two or more individuals. 3. Corporation – is a business that is owned by its shareholders and is organized under operation of law that has separate and legal entity. Sole proprietorship, partnership, and corporation are all types of business organizations. Learn about the advantages and disadvantages of each to start your very own business. Accounting Clerk – one who records, sorts and files accounting information. An accounting clerk may specialize in cash, payroll, accounts receivable, accounts payable, inventory, or purchases. Bookkeeper – one who generally supervises the work of accounting clerks, help with daily accounting work, and summarizes accounting information. Accountant – one who designs the accounting information system and focuses of analyzing and interpreting information. In small businesses one person is normally hired to act as bookkeeper and accountant. In large firms, bookkeepers focus on the processing of accounting data. Accounting is a service activity whose function is to provide quantitative information, primarily financial in nature, about economic entities, that is intended to be useful in making economic decisions. In general sense, Accounting is an information system that provides repots to stakeholders about economic activities and condition of a business. 1. Assets – economic resources of value that is owned by a business. This commonly includes cash, receivables, inventory, land, building, machinery and furniture. 2. Liabilities – economic or legal obligation that a business owes to other businesses of individuals. This commonly includes accounts payable, note payable, payables to government and unpaid (accrued) expenses. 3. Owner’s Equity – is the owner’s interest in, or claim to the assets of a business. It is the difference between the amount of assets and amount of liabilities. 1. Revenues – inflows of assets resulting from the sale of goods and services. Revenues increase owner’ equity. 2. Expenses – outflows of assets resulting from cash spent or liability incurred to produce revenue. Expenses decrease owner’s equity. 3. Net Income (Loss) – the excess (deficit) of revenue over expenses for an accounting period. Net income increases owner’s equity while net loss decrease owner’s equity. What are financial statements? Good financial statements are essential to companies as it evaluates the health of the business. Financial statements include the income statement, statement of changes in owner's equity, the balance sheet, and statement of cash flows. Watch to understand what these terms mean. Accounting is a measurement and communication process designed to provide useful and timely financial information. This process includes identifying, recording classifying, summarizing, and interpreting business transactions. 1. Identification – those events that is financial in nature that should be recognized and recorded. 2. Recording – transactions maybe recorded manually, with the use of mechanical devices or with the use of computers. 4. Summarizing – is the stating of groups of data in concise form. 5. Interpretation – provides explanation and develops relationships that give meaning to the information. Assets – are the resources owned by the business that will provide future benefits. Liabilities – are the rights of the creditors that represent the debt of the business. Owner’s Equity – are the rights of the owner in the business. This is the amount by which the business assets exceed business liabilities. The accounting equation must always balance. The peso amount on the left side of the equation should always equal to the peso amount on the right side of the equation. If the assets increase, liabilities and/or owner’s equity must also increase by the same amount. If assets decrease, liabilities and/or owner’s equity must also decrease. An increase in an asset may also have a corresponding decrease in another asset or an increase in a liability may also have a corresponding decrease in another liability. Learn about what double entry accounting means... plus the five major T-account types as well as how debit and credit affects each. This short video explains the debit credit framework used to account for business transactions, as presented in Fundamentals of Financial Accounting, 2e, by Phillips, Libby, Libby.